I'm not entirely sure how to label this short animated Russian holiday special from 1959. The New Year Voyage is a more accurate translation of the Russian title, but it was released in the US under the names "The Christmas Visit" and "A Christmas Tree." The version we saw was dubbed into English and explicitly set at Christmas, though the original took place on New Year's. This isn't at all surprising - it was illegal to celebrate Christmas in the Soviet Union when this was produced. Despite that, the special is filled with trappings and elements that would feel at home in American Christmas specials from the same period. The story follows a Russian boy whose father is stationed in Antarctica. It's Christmas Eve (New Year's Eve), and the child is distraught his father is going to wake to Christmas morning (New Year's Day) without a Christmas Tree (New Year's Tree). The kid grabs his decorated tree and heads outside in the hopes of finding a way to get it to his father. First, he tries a cab, only to be informed the driver can't handle the job. 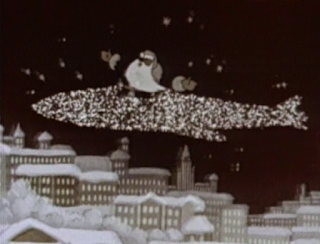 But the cab driver notices Santa Claus (I'm assuming this was Father Winter in the Russian version, but I can't find anything that verifies that) landing his magical jet airplane. The kid asks for Santa's help, and Father Christmas/Winter/Whatever is happy to lend the kid his plane. That said, it comes with a caveat: the kid needs to hurry and deliver the tree before the twelfth bell rings at midnight, or the magic will be gone. Santa warns him not to stop or slow down for anything. Remember this, because it doesn't come up. The kid seems to follow his instructions alright, but a sandstorm destroys the plane over Africa. The boy survives by using his tree like a parachute, but he's left stranded without much time. Fortunately, a friendly talking lion shows up and takes him to the ocean, where a bunch of monkeys build him a raft. The ship isn't quite seaworthy, but a friendly whale shows up and brings him the rest of the way. By now, the child's nearly out of time. Frantically, he carries the tree through the frozen tundra looking for his father. He runs into some penguins, but they're idiots so they wind up costing him time. He finally sees the research station appear in the distance at midnight. He wakes up at home on New Year's Christmas, and he gets a telegram from his father saying a plane dropped a tree for the holiday. Everyone's happy, including his mother who hadn't even been mentioned up until this point. The animation in this is quite good. I'm not sure if it's a case of like sources, but I caught a few moments - particularly in the water at the end - that reminded me of sequences from The Snowman. The scene in Africa with the lion also felt similar to the scene in Arthur Christmas where the leads crash landed and were attacked. If anyone has any idea whether either of these was inspired by this short, I'd love to know. The glimpse into Russia's integration of western holiday traditions makes this a fascinating piece, even without the benefit of good animation. That said, I'm not sure the translation is worth watching for anyone who isn't interested in the history of the holidays, Russia, and/or animation. It's a decent enough short which leans into its dreamlike premise well, but it loses a lot of goodwill due to tedious narration added for the English dub. Several versions are easily located on Youtube if you're interested.